The biggest event to happen in social media since the creation of Facebook Fan Pages quietly hit the internet last week - Google launched Google+ Pages, finally opening up the amazing Google+ platform to businesses. With the information I am giving you now, you are right at the 'bleeding edge' of social media. Take what I have made and put it into action right now before everyone jumps on the Google+ bandwagon. It happened with Fan Pages and it will happen with Google+ Pages too. Now you can turn my hard work to your advantage by nailing that vital First Mover Advantage. 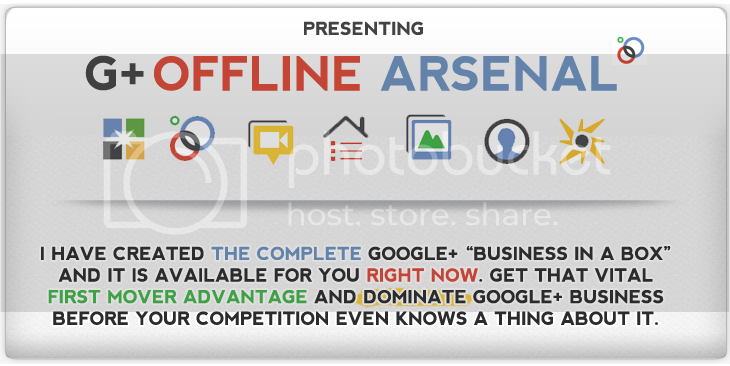 G+ Offline Arsenal teaches you EVERYTHING you need to know about Google+ Pages and gives you the promotional and lead sourcing materials you need to DOMINATE this market before your competition even knows what hit them. Don't be the person sitting on their hands thinking "why didn't I start offering Google+ Pages and consultancy" as you see others bag clients all around you. Just like FB Ignition, Facebook Offline Arsenal and all my other "business in a box" WSO's, this one will set you up for business right away. Take the First Mover Advantage I am offering you and run with it using G+ Offline Arsenal. - Custom designed Squeeze page with embedded video and opt-in. Drive traffic here to get leads. 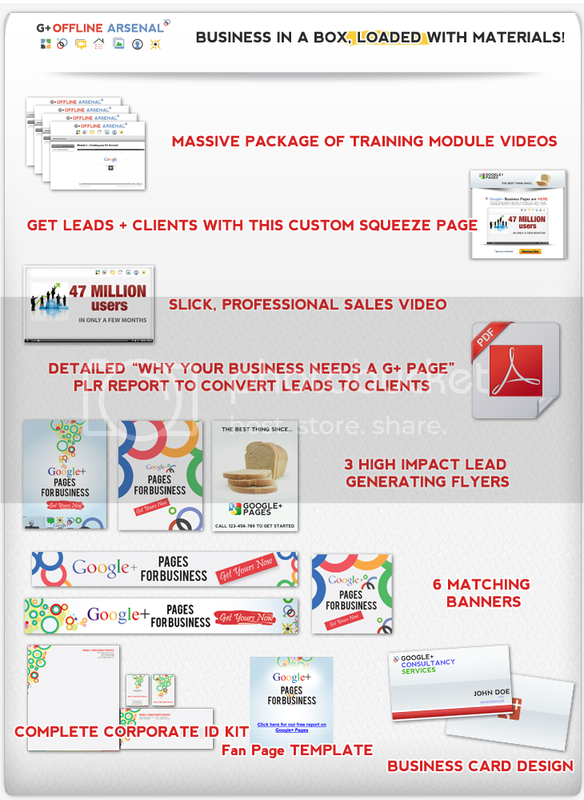 - Detailed "why your business needs Google+" personal PLR report to send after opt-in. Convert your leads to sales with this. Vital! - Facebook Fan Page template: where better to tell people there is a new kid in town than on their arch rivals system! - Adding more all the time! Time is vitally important if you want to get on top of this. Most people do not even know you can have a Google+ Business page. Now, when you tell them the worlds fastest growing social media site (47 million users in a matter of weeks) now has a system for them to highlight their business and engage with customers in totally new ways, the selling will take care of itself. all important First Mover Advantage today. This looks like a bargain for a new business in a box. Wow, never been first buyer before! Thanks, Martin, for another great WSO and OTO! Another awesome product by the looks of it Martin. Can I please send you the $17 via AlertPay? If you have a desire to do local marketing or make fast cash with a new local business package- then this is it. Google just added their pages option last week! This means you have a chance to get in first before your competitors do. Take action. Remember action takers are the money makers! Another genius wso Martin! When You're connected with Martin, you're hitching a ride with success!! Very delighted to be one of the first adopters in this exciting new area, and Martin's excellent content will unquestionably be the rocket fuel to launch the action takers into the stratosphere. Wow!...yesterday I was try to convince a soon to be customer of mine with this Google+ stuff...I wasn't too much informed myself. But know I have the arsenal! Just bought it. I'm gonna check and let you know...Thanks Martin! Have to agree with Tim, action takers are money makers. Thanks for the early notice too! Totally awesome Martin... I'm in. BTW: You're right... as offline expects we need to stay up with the latest and this will help. Martin is one of two or three warriors whose WSOs I buy without even reading the sales copy. There’s no time (price rises too fast) and there’s no reason (the quality and over-delivery is OFF. THE. FREAKIN’. HOOK. As a member of Martin’s list I had early-bird notification this was coming, so I was standing by with an itchy trigger finger waiting to hit the buy button. Can’t wait to dive in. Kudos, Martin, for once again being on the cutting edge with another value packed product. This is absolutely a MUST HAVE..! Can't wait to get this & employ these techniques..!! Purchased the Google+ Biz in a box and can't wait to incorporate it in to my upcoming launch! Will come back and post comments after going throught the course. WOW, This is awesome stuff. This will keep me on the cutting edge. kickin yourself later for not buying it. Looks amazing Martin! I just picked it up and will submit my personal review once I have had a chance to go through the material and set-up myself up. Love your stuff..always way over-delivered..but this one I have not yet been able to grab. Something a little wonky on the link. I will have to try again in a bit! 1. They are end-user specific and explain what need it fills for a business. 2. They teach how to sell the product and service to a business. 3. They are branded and designed as a turnkey stand-alone vendor solution. I saw a Google+ notification about Business Pages about a week ago. It was a blog post. I could glean something from it, but in terms of approaching a business with a service, I don't have the time to put all of this together. Last but not least : Google Search, Google Maps, Google Places, Android, Android Apps, Google + pages. I see a trend here maybe I can't be all things Google, but when was the last time you were about to jump on something FIRST, and keep track of it from the inception, that was global , scalable and reached tens of millions of end- users? The Ground Poundingly Ingenuous way to be ahead of the curve and leave all your competition in the dust!. Simply the best decision that you will make today is buying this package and putting it to use!.. Google + is not just the place you need to be now on this planet,but in the whole solar system.! Martin is one of the most genuine and respected creators on the forum,and always goes out of his way to over-deliver.....Thank You again Martin.! not even an affiliate - I already get great value from Martin. It's with products just like this that Martin has opened up areas to me that I'd have been too scared to go near before. - His training is first class and focussed - No 2 hour pitch webinars every other day. - He creates High Quality polished products that I can use straight away. - He really knows how to look after his customers. Invest in something that can be used straight away to make your business thrive. - How much do you think you'll have to pay for Martin's time this time next year? No brainer on offer and OTO, thanks Martin! Got it! Thanks for the massive WSO on what could be the hottest opportunity for local biz builders in the next few months!! Looks like you done it again. This really looks amazing. Can't wait to get stareted. This is an absolute no-brainer! Where else can you get an actual "business in a box" for less than $20 bucks? I mean, Martin has created everything for you in an easy and organized fashion and all you have to do is print it out, watch the easy training course and get out there and start profiting before everyone else. Not only will this make you the leader but because of that clients will trust that you are on the cutting edge and buy more from you. Thanks again Martin for an amazing product! Martin, I've been hearing about the new G+ business pages, and had planned to start looking into it for myself and clients. Then, here you come charging in like the proverbial White Knight in Shining Armour to save the day! To get a complete... and I mean complete... biz in a box for G+ business pages is a HUGE time-saver. And, it's really professional looking! I purchased your FB Ignition program when it first came out and it started another business model for me to profit from all on its own. For that I and my outsources doing that work thank you. For those who are skeptics about you or your products. They should know that you over deliver in all the products and unannounced bonuses you send out periodically. Unlike most WSO sellers who just plain spam the heck out those who are dumb enough to stay on their list after purchase. I actually look forward to your emails because they are either good information I can take action on, or lessons I would of had to search for to discover. This was a no brainer to purchase even at the $20.90 I purchased for even though I was on the early bird list and waited too long I guess. Keep up delivering like this and I will be a client for life. This product is being sold by: Martin Crumlish with a 45 days refund period.